Alan I. Trachtenberg, M.D., M.P.H. Michael F. Fleming, M.D., M.P.H. Prepared by Health Science Communications, Inc., New York, N.Y., based on interviews with and reviews by Alan I. Trachtenberg, M.D., M.P.H., and Michael F. Fleming, M.D., M.P.H. This American Family Physician monograph has been funded with federal funds from the National Institute on Drug Abuse, National Institutes of Health, under Contract No. N01DA3-2400. 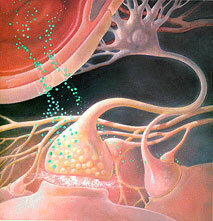 The cover to the left depicts a stimulant drug (in green) such as cocaine or amphetamine penetrating the blood-brain barrier and causing an increase of extracellular dopamine (in white) in the nucleus accumbens. This causes behavioral reinforcement of drug self-administration. This American Family Physician monograph is made possible with federal funds from the National Institute on Drug Abuse. The information presented and opinions expressed herein are those of the authors and do not necessarily represent the views of the sponsor or its parent agencies, the National Institutes of Health or the United States Public Health Service; American Family Physician, or its publisher, the American Academy of Family Physicians. Any recommendation made by the authors must be weighed against the physician's own clinical judgment, based on but not limited to such factors as the patient's condition, benefits versus risks of suggested treatment and comparisons with recommendations of pharmaceutical compendia and other authorities.